When you regularly use your oven for grilling, roasting and baking, your oven racks are usually the first thing to get covered in grease and grime. Although a professional oven clean can really make your oven racks look brand new in no time, it might be worth occasionally doing some DIY maintenance in between visits from Ovenu. As cleaning oven racks can be a bit of a chore, we recommend you factor in at least 10 hours to finish this task, which includes the essential soaking time. With decades of collective experience in oven cleaning, it wasn’t hard for us to put together a comprehensive list of methods for cleaning oven racks. Although varying in effort and results, the following methods are worth trying for removing stubborn grease and burnt-on foods. Oven-cleaning bags are specifically designed for cleaning oven racks and grills. As they contain an aggressive cleaning solution, make sure you wear household gloves when handling and place a maximum of two racks in the oven bag to soak overnight. Tilt the bag after two hours, so that the racks become recoated in cleaning fluids. The next day, wear household gloves again as you remove the racks from the bag and rinse them in hot soapy water. Read our comprehensive user manual for oven-cleaning bags. A quick and easy way to remove dirt from your oven racks is with a simple oven-cleaning product. Lay the racks on an old cloth or rag in an outside area, spray them with the cleaning product and leave them to soak overnight. The next day, rinse them with water and rub off any stubborn bits as well as you can before wiping the racks dry. Warning: the efficacy of this method depends on the product. 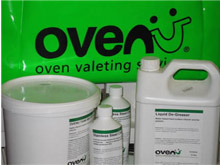 Ovenu has reviewed six eco-friendly oven-cleaning products to help you make an informed choice. In case your oven racks only need a mild clean, bathing them in a hot bath with dishwasher powder might be the appropriate solution. Make sure you protect your bathtub from scratching by placing towels or sponges underneath the corners of the racks, then fill the bath with just enough water to cover all of them. Crumble a dishwasher tablet into the water and leave the racks to soak overnight. The next day you will be able to rub off mild stains using a sponge and warm water. One of the best ways to clean oven racks yourself is to use baking soda and vinegar. Sprinkle baking soda on to the oven racks, then drench them in vinegar in a large sink or in the bathtub (protecting your bathtub with towels). The chemical reaction between these two cupboard essentials will result in an eruption of bubbles and foam – once the reaction is over, the racks can be submerged in hot water and left overnight. The next day, scrubbing the racks clean will be easily done with a dishcloth or toothbrush. Learn how to clean your oven with common products from your cupboards. If your oven racks are very heavily soiled, the safest option is to arrange a visit from a professional oven-cleaning company. However, if you aren’t afraid of using some heavy chemicals you might want to try the ammonia and rubbish bag method. Wearing household gloves to protect your hands, put your oven racks in a rubbish bag and pour half a cup of ammonia over each. Tie the bag tightly, removing as much air as you can, and turn it several times to cover all the surfaces. Leave the bag outside for three hours. Now, wearing your household gloves for safety, remove the racks and wash them thoroughly with washing-up liquid. Warning: you’ll need to perform this process outside or in a very well-ventilated room. Ovenu is not responsible for any damage caused by harsh chemicals. Although a self-cleaning oven doesn’t remove the need for a regular deep clean, it is very useful for increasing the lifespan of your oven by facilitating regular surface cleans. 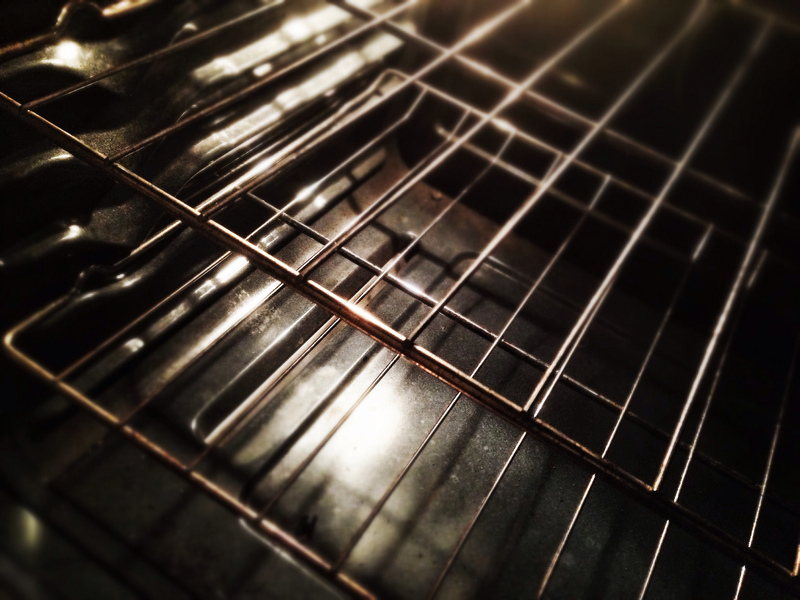 If you are looking to clean your oven racks, simply keep them in the oven when you turn on the self-cleaning feature. Warning: cleaning your oven racks with the self-cleaning feature may cause them to become rough and lose their shine. If you want to ensure your oven racks maintain their shine, call on Ovenu to give your domestic oven a professional deep clean. Our experienced technicians know every bit of your oven inside and out, and use top-quality oven-cleaning products that are kind to your lungs and the environment! Oven cleaning doesn’t have to be hard. Call 0800 140 9800 to receive a free quote today!